is this music?» features Album review: Pat Nevin - interview - is this music? Football and music don’t mix, eh? Try telling that to the legions of Lionel Richie fans who enjoy nothing better than a night at Stringfellows. Recently a story on one of the Scottish indie web forums mentioned a story about Pat Nevin getting himself sent off so he could get away early enough to see Siouxsie and the Banshees in time. Unlikely it may have seemed, but then a user called “Pat Nevin” emerged to set the story straight. With this emerged ‘sightings’ of the former Scotland international – now working as a football pundit – mainly, it seemed, at Camera Obscura shows. Tonight we’re chatting in a hotel lobby before he heads off to see Howling Bells. Despite the interest in music, he’s never been a musician. “When you’re young, if you’re half-decent at one thing you realise you’re not half-decent at other things!” So, the music’s world’s loss is football’s gain. “In the school band, I wanted the sax but they wouldn’t give me it – and you’ll never get girls with a clarinet!” Eventually, a choice had to be made between studies and football. To guard against any rare moments of celebrity, the answer lay in the fashion of the day. “I always walked with my head down and used to wear a ‘gloomdoom’ coat, with the collar up,” he says – think any photo of Joy Division or Echo and the Bunnymen. So his musical tastes gradually became known. “I was at Chelsea and the tabloids would asked me to do interviews, so I’d take the piss out of The Sun – ‘I like music, there’s this singer called Joy Davidson’ – very infantile of me!” he laughs. “What I wanted to do more than anything else was interview John Peel – because basically I wanted to meet him,” he recalls. “So I wrote a letter, and got a nice letter back saying he was very busy, maybe try next year.” So – “for the first last and only time in my career” – he played the fame card. “I wrote, as subtly as I possibly could – ‘I play for a football team and we’re playing Liverpool in a few weeks’. He phoned up the next day – ‘Why didn’t you say?’ ‘I couldn’t’!’” A long friendship based around gig-going ensued and Pat took full advantage of his time in London. “It was brilliant, becoming the friend of one of the few people I’d call a hero”. After a successful first year at the club, his rather meagre wage (by today’s footballing standards) was barely enough to cover his London rent. So, he went to see chairman Ken Bates – a formidable and eccentric figure, as Partick Thistle fans of a certain age may remember from a bizarre stint with the Glasgow club. Even so, Nevin wasn’t prepared for what he describes as “a real CJ moment” as Bates laughed at and binned Nevin’s written demand, then marched out and drove off in his Rolls Royce Corniche. Which left the footballer free to rifle through the chairman’s desk, work out the “mean, mode and median” wage from the player contracts he found, and present the new demand next day. “That’s more than last time,” said a shocked Bates. 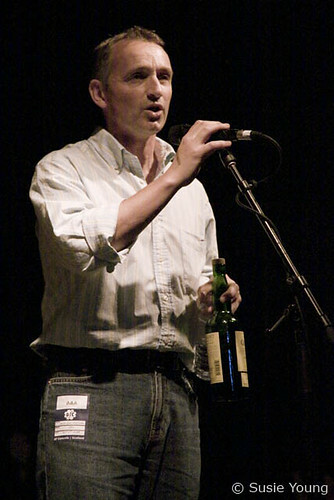 “I know, but it is the average,” Nevin replied. Conveniently, the delay meant his contract was unsigned as the team prepared for a friendly with Brentford – the same night that New Order were playing at the Royal Festival Hall. For someone who’d never seen Joy Division play live, a plot emerged. “I’m not re-signing unless you take me off at half time,” he told manager John Neal. Nevin got to see the gig, and the rest is the stuff of legend. Despite Nevin’s efforts – he was player of the year – Chelsea got relegated – a far cry from today. But he remained in the top league, signing to Everton for close to a million pounds. Happily, his musical interest wasn’t curtailed too much, living in the comparatively affluent Chester suburbs. With Madchester and The Smiths in their ascendancy, the move was convenient for not just footballing reasons. And indeed, provided more proof that football and contemporary music are unlikely bedfellows. 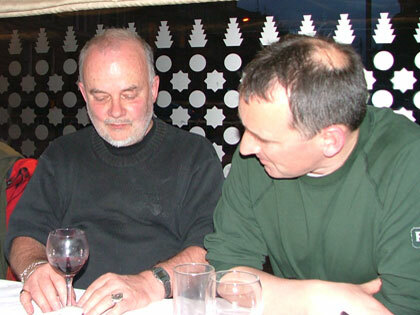 Nevin became friendly with Vini Reilly – guitarist with Factory act The Durutti Column, and former bandmate with one Steven Patrick Morrissey. An invite to Moz’s mansion followed, in the leafy suburb of Bowden. Nevin enlisted the help of teammate, Northern Ireland international Norman Whiteside, for directions to the area. “I live in that road! I’ll come down, we could all get pished together!” Whiteside offered. “I couldn’t do it, so decided to tell him I couldn’t find his house”. A fascinating evening chez Moz followed. “He’d bought a grand piano specifically so Vinny would play that night,” Nevin reveals. And the pair were given a full tour of the turreted mansion. “There was one room we’d not seen, but we eventually persuaded him to show us… his multi-gym!” The image of the bequiffed one working out with gladioli sticking out the back of his shorts is one which is best expunged from one’s memory. “He always was built like a brick shithouse,” Nevin reckons,”but you’d not have known at the time”. Norman wouldn’t necessarily have enjoyed the muso chat anyway, something he shares with most of his contemporaries. And Scottish international duty showed that in general players north of the border have just as dubious taste in music – with one exception. “The SFA stuck me in the same room with Brian McClair,” he recounts, and the usual awkward silence ensued. “’What’s your name?’ ‘Pat. Yours?’ ‘Brian.’ Silence. So I took an NME out of my bag and started reading it. He took out his copy of Sounds.” Inevitably, the two became good friends. Trips abroad offered a chance to get to examine the footballing psyche further, but it immediately became obvious that in most cases this extended to booze and cards, despite the chance to see some of the most exotic areas in the world. “Everywhere I go, I go to see galleries and architecture, it made me normal and them abnormal.” Chelsea’s choice of pre-season friendly destinations led to some odd encounters, including a breakneck trip across Baghdad to make kickoff against the Iraq national side – only to be forced to wait in the baking sun for 30 minutes until one Saddam Hussein arrived. Not only was their Baghdad Cup victory rewarded with a disappointing trophy – “the runners-up cup was bigger than me” – but the home team were reported as winners in the local press. Communist Bulgaria seemed like a more daunting place at that time, but Nevin found the locals almost too friendly. Nevin moved to Tranmere – and spent three seasons reaching the playoffs, but never quite managing to gain promotion to the Premiership again. He moved north to Kilmarnock, timing his return nicely with an upsurge in the Scottish music scene with the emergence of Belle and Sebastian in a lively Glasgow. Though his gig-going was curtailed by a spell as chief executive of Motherwell, which he describes as “the stupidest thing I’ve ever done,” the 100-hour week a massive strain. “It was great to learn from and all the rest of it,” he admits, “but wasn’t an enjoyable job”. 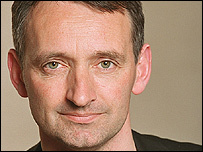 As well as regular punditry appearances, Pat Nevin can be found at a Camera Obscura show near you. 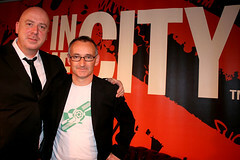 ‘Live’ image by Susie Young, Simon Raymonde pic by Katy Baker@in the City, Peel pic from the BBC. N.B. This article originally appeared in is this music? issue 24 / Winter 2006. It is reproduced here in fully proofed and spellchecked form, with some extra sections. The printed version was as readers of itm? will recall, subject to technical difficulties caused by a chimp with ADHD typesetting the original copy.